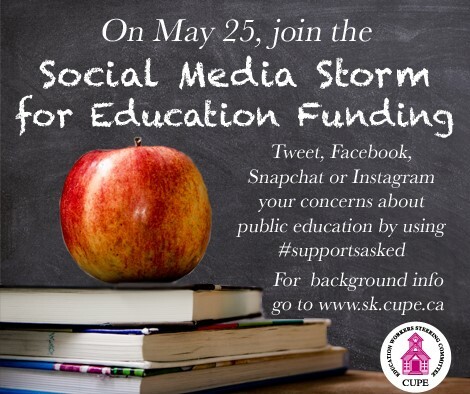 Join the Social Media Storm for Education Funding on May 25! Investing in the education of our children is one of the most important things our government can do. In Saskatchewan, there are growing concerns about what the approximately $260 million provincial budget deficit will mean for school boards across the province. Though the premier has said education will see a “modest” increase, many school boards are being told to budget for the worst case scenario. Many school divisions are already feeling a budget pinch. Many school boards are dealing with increased enrollment and more complex student needs. Even a modest increase will not be enough for some school divisions to meet the need for frontline support staff. And when education support staff get cut, it’s our children who suffer. We need to stand together now to ensure that education in this province is properly funded. Please join us on May 25 for a “Social Media Storm for Education” and share your message for the government on Facebook and Twitter. Read the backgrounder to understand how budget shortfalls are already resulting in layoffs and extra fees for parents.